Where Are Grandma’s Recipes? Legacies Lost? The real truth is that my grandmother never followed a designated recipe when she cooked. Devoid of any particular method, she purely cooked by taste alone. If something was too tart, she would simply add a little more sugar to cut the flavor; if something was too sweet, she would add salt or vinegar. She had pot luck remedies to make everything taste good. In fact, there was no respect to measuring either. If you asked her for instructions, it would go something like this; take a “pinch” of salt, a “dash” of sugar,” or a “handful” of any other additional ingredient needed. Aside from the fact that few people had her “petite” hands, no one in the family could ever replicate her special delicacies. Who could accurately measure a “pinch” or a “dash?” As a European immigrant, she was old world and old school, and never had time nor the inclination to share her unorthodox techniques. So sadly, when she eventually passed, those special culinary secrets died along with her too. Regretfully, her children (my Mom and her 3 sisters) never wrote anything down, so all we have now are just the savory memories. We all especially miss her kufteles, a mysterious cold chopmeat patty, and her kreut strudel, some kind of garlic and cabbage treat that we all fought over. I’m saddened about the legacies lost, a missed opportunity to pass on to the next generation. Of course, we can always try to hunt them down through a myriad of cookbooks, but I’m confident that our family favorites surely won’t be there. Or we could google a close facsimile, but even if a mouth-watering, delectable photograph pops up, I know it won’t be grandma’s version. Like photos, recipes bridge generations together and help tell our life stories. The sense of smell is very powerful, and they act as strong triggers to rekindle moments. Close your eyes, and I bet you can recall a pleasant childhood memory of a family dinner and connect it with a particular scent or favorite food. A kitchen filled with familiar aromas can be very comforting. It is the very heart of our home. So if you are a foodie, and love your mom, grandma, aunt’s, or any family member’s special recipes, take the time to document the classics. Organize your family recipes so that the savory memories can endure. Write it down somewhere so you can retrieve it. Or better yet, teach your children how to cook, engage them by involving them in the process. My beloved mother-in-law (who has since passed) was famous for her homemade gefilte fish, her signature dish. Having only sons, her old-fashion values excluded them from the kitchen so they never paid much attention to how long she labored in this process. As daughter-in-laws, we should have. One time, we did ask her to write it down, but it was written in the same obscure and vague way that my grandmother described, so we laughed and let it go. It was something we grew to expect at every holiday dinner and delighted in its delicious flavor. Moreover, we were thrilled that we didn’t have to make it . Years later, when we started making our own holiday dinners, we all yearned for the revered gefilte fish. But it was too late. Her Alzheimer’s disease had robbed her of memory to even recall who we were, albeit her favorite recipe. Now, when a holiday comes around, it pains us that we must resolve to buy gefilte fish in bottle. Shame on us. I have a friend Candi, who is as passionate about cooking, as I am about organizing. She has an active blog; cookingwithcandi, where she shares “tried and true” recipes with friends, family, and avid followers. One of the reasons she decided to launch this site was because she wanted a place for her daughters to glean all her culinary artistry in one organized place, one stop shop, forever! Kudos to her…now her recipes can be passed down from generation to generation for all to enjoy. Candi’s post are timely for each season, holiday, and all the days in between. She inspire her readers to punctuate their life events with tasty food, because she understands it not only adds to the “happy,” it makes the moments memorable. Using cooking as a fun bonding tool, you can often find Candi cooking with her grandchildren, not for them. Teachable moments at their core. For me, huge lesson learned. During my mom’s recent visit this past Passover holiday, I was intent on learning how to make her special chopped liver (best above the rest). Usually, we are together side by side in the kitchen, but we are micromanaging different food preps. But this time, I was determined to glean her masterful craft. She’s getting older and it occurred to me that the long process was getting harder for her. 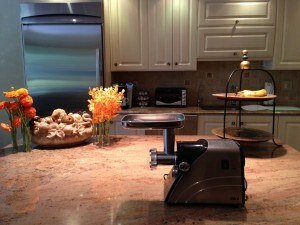 Back in the day, she used the old-fashioned grinder that bolted to the countertop. Having tossed that years ago, she has resorted to the painstakingly task of using my hand-held grater. So in attempt to minimize the efforts and maximize the results, I surprised her with an electric meat grinder this year. OMG, this mean machine was game changer, big time. Under her tutelage, we cut down the process by hours. It yielded way more liver, eliminated the grizzle, and the interior parts cleaned like a dream. FYI, we also decided to break it down into more manageable steps in 2 days, (we sautéed the onions and boiled the eggs the day before) so the kitchen clean-up was minimal. The experience was great; we laughed so much, made a few bloopers, and I made sure my notes would be foolproof for next year. As for my grandmother’s special kufteles, my mother-in-law’s gefilte fish and kreplach, they are tragically a lost art we can never recover. But at least, we shall always have chopped liver. Have you organized your family recipes to be legacies? Some food for thought, lol: With smart technology, you can opt for filming “live” cooking sessions and video the recipes! 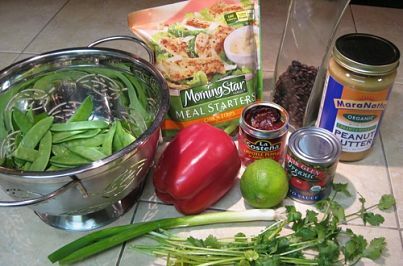 Easy to follow, interactive, and personal recipes beat a store-bought cookbook any day of the week. Would make a fabulous gift too! Yes, lol the term is a “bissel of this and a “bissel” of that. Think that back in the day, cooking was an everyday activity and “dining out’ wasn’t an option, so moms threw ingredients together with no regard to measure… it didn’t matter, as long as it tasted good. Today’s culture is all about “fine food” and so the activity of cooking has been elevated to new heights. I think recipes have become paramount (it’s a safer guideline) and following them have morphed into an exact science, rather than free falling.